These diabetes-friendly dishes are full of rich flavors. People with diabetes can enjoy red meats and pork, but they should eat these proteins in moderation and try to choose the leanest, highest-quality cuts available. New York strip steak. 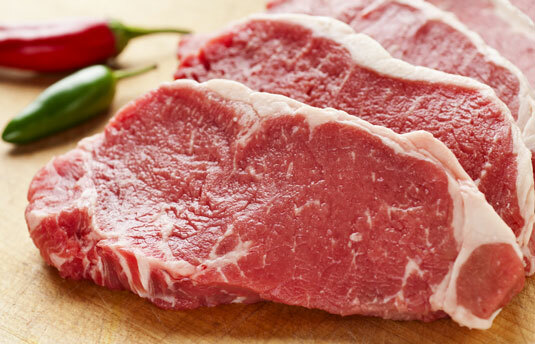 When eating red meat, try to pick the leanest, highest-quality cuts available. Slice off the stem end of each pepper and remove the seeds. In a medium bowl, combine the beef, onion, quinoa, spinach, oregano, salt, pepper, and 1⁄3 cup tomato sauce; mix well. Stuff the mixture into the peppers and place them in a medium saucepan. Pour the wine and remaining tomato sauce over the peppers. Bring the peppers to a boil; cover, and let simmer until tender, about 45 minutes. Add a few tablespoons of water if the sauce begins to cook away. Transfer to a serving platter, drizzle the remaining sauce over the top, and serve. You can use this basic filling to stuff zucchini or yellow squash, too. Per serving: Choices/Exchanges 1/2 Starch, 3 Nonstarchy Vegetable, 4 Lean Protein; Calories 280 (from Fat 50); Fat 6g (Saturated 1.7g, Trans 0.2g); Cholesterol 80mg; Sodium 460mg; Potassium 1260mg; Total Carbohydrate 23g (Dietary Fiber 6g, Sugars 9g); Protein 31g; Phosphorus 385mg. In a large skillet over medium heat, heat the oil. Add the onions and green pepper, and sauté until the onions are translucent (about 5 minutes). Add the tomatoes, chili powder, celery seed, garlic, salt, and cumin; cover and let simmer over low heat for 20–25 minutes. This allows the flavors to blend. Preheat the oven to 350 degrees F. Trim all visible fat off the steak. In a nonstick pan or a pan that has been sprayed with nonstick cooking spray, lightly brown the steak on each side. Transfer the steak to a 13-x-9-x-2-inch baking dish; pour the sauce over the steak, and cover. Bake for 1-1/4 hours or until the steak is tender. Remove from the oven; slice the steak and arrange on a serving platter. Spoon the sauce over the steak and serve. Lamb would also work well in this recipe. Serve with brown rice or mashed cauliflower. In addition to its great flavor, cumin is also known for its anti-inflammatory properties. Because inflammation plays a role in illness, reducing it can lead to better overall health. Per serving: Choices/Exchanges 1 Nonstarchy Vegetable, 4 Lean Protein; Calories 200 (from Fat 50); Fat 6g (Saturated 1.6g, Trans 0.0g); Cholesterol 50mg; Sodium 270mg; Potassium 450mg; Total Carbohydrate 7g (Dietary Fiber 2g, Sugars 3g); Protein 28g; Phosphorus 195mg.